Boil up the milk and cream with 50 g of icing sugar, season with salt. Add the chestnuts and boil for approx. 30 mins. until soft, drain. Pass the chestnuts through a food mill into a bowl, allow to cool slightly. Add the remaining icing sugar, vanilla sugar and lemon juice, purée, cover and refrigerate for approx. 2 hrs. Beat the egg whites with the salt until stiff. Add half the sugar and continue beating until the egg whites becomes very stiff and glossy. Add the remaining sugar and briefly continue to beat. Transfer the egg white to a piping bag with a serrated nozzle (approx. 10 mm in diameter). On a baking tray lined with baking paper, pipe 8 meringues each approx. 8 cm in diameter. Bake for approx. 10 mins. in the lower half of an oven preheated to 150°C. 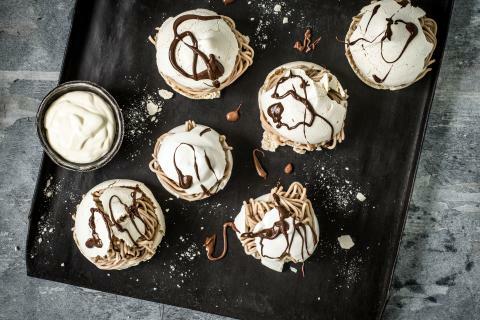 Reduce the heat to 80°C and allow the meringues to dry out for approx. 1 hr. Then switch the oven off and leave the meringues to cool in the oven with the door open. Cut the meringues in half crosswise. Squeeze the chestnut mixture onto the meringue bases through a vermicelli press, place the meringue lid on top. Garnish the meringue with chocolate. Use kirsch instead of lemon juice.